We’d love your help. Let us know what’s wrong with this preview of The Kings Are Already Here by Garret Weyr. To ask other readers questions about The Kings Are Already Here, please sign up. "When the obsessive worlds of chess and ballet collide, they illuminate each other and transform two lives." made me buy this book. But it was youth and mediocrity which I found colliding here, illuminating my mind and making me realize that not all books with chess in it deserve five stars. "The pieces all move according to their own rulles and have different point values. The winner is the person who, finally, either checkmates the other king or winds up with more points on the board." e. when your opponent's time runs out. "Jasper ignores everyone but Nikolai. Nikolai follows Jasper everywhere. How nice they have each other." "I don't believe in God or anything like that, but someone is in this building. Someone besides me and the people visible to my eye." I got this book a looooong time ago from Emery and just dug it up from my mother’s house in my search for short books to read before the end of the year. I love the dynamic in this book. There’s a chess player and a ballerina – two professions you wouldn’t consider very similar – but the book plays up their similarities and differences and makes you realize that it could have, almost as easily, been about any two subjects that take intense concentration, talent, and practice to master. I love the I got this book a looooong time ago from Emery and just dug it up from my mother’s house in my search for short books to read before the end of the year. I love the idea of this book. But I find it difficult to like the characters. None of them stuck out as particularly loveable to me. I didn’t like Phebe or Nikolai in particular, and Phebe’s parents weren’t much better. They were likeable enough, I suppose, but I didn’t feel a deep enough connection with either of them to actually love them. Interesting juxtaposition of themes—ballet and chess both used as vehicles to explore passion and grace and skill and talent and calling and the question of what constitutes success. It ends up being far more about chess, as Phebe is trying to figure out whether it's time to make a graceful exit from the ballet world and has largely ceased to care; Nikolai, meanwhile, is entirely consumed by his devotion to chess. Not as engaging to me as I would have hoped, though I'm not sure if that's due to t Interesting juxtaposition of themes—ballet and chess both used as vehicles to explore passion and grace and skill and talent and calling and the question of what constitutes success. It ends up being far more about chess, as Phebe is trying to figure out whether it's time to make a graceful exit from the ballet world and has largely ceased to care; Nikolai, meanwhile, is entirely consumed by his devotion to chess. phebe is a dancer trying to decide if she wants to dedicate her life to ballet. nicolai is a chess-player, escaped from his tyrannical father but abandoned by the teacher who promised to help him. phebe comes to geneva to spend the summer with her father, who is acting as something of a guardian to nicolai. they both must consider what it means to give their lives over to these singular passions, if chess and ballet are really what they believe in above all else. ehh. 2.5 stars rounded up. freym phebe is a dancer trying to decide if she wants to dedicate her life to ballet. nicolai is a chess-player, escaped from his tyrannical father but abandoned by the teacher who promised to help him. phebe comes to geneva to spend the summer with her father, who is acting as something of a guardian to nicolai. they both must consider what it means to give their lives over to these singular passions, if chess and ballet are really what they believe in above all else. Although I thought the plot was very original, I had a lot of problems with this book. Both narrators' voices sounded the same to me, and I found it hard to grasp the reasoning behind their actions. I’m also not really clear on just when this book was set—sometime during the Cold War I think, but during the sixties, the seventies, what? This was, however, an intriguing glimpse on the inside of both chess and ballet. I think the only reason I liked this book was because of the ballet theme. It wasn't a bad book, but the mystery/suspense part of it didn't really grab me. I guess, in addition to the ballet, the book's saving grace was the well-developed main characters, although I'm not sure how believable some of their behavior was. This is not a bad book, the writing is pretty good but I guess it just wasn't for me. The main topic is chess and even though that didn't totally put me off, it wasn't very interesting either. I highly recommend My Heartbeat by the author, I liked that one a lot more. My least favorite of her 4 books, but it's still very good. Since her most recent book is my favorite, I'm expecting more very good books from this author. There is a lot of interesting thinking in KINGS, but not quite as interesting a story. I'd probably give this 3 1/2 stars if I could, but I'm rounding up. Another solid book. Chess-playing boy and ballet-dancing girl tell parallel stories to good effect. Freymann-Weyr can really get inside the heads of the serious kids, and make a compelling story out of what she finds there. This book took a few tries to get into, but once into it, Freymann-Weyr delivers as always. Interesting characters, lovely dialogue, good story. Tedious. I never saw a reason to care about either character. Memorable. I still remember this book and I read a lot of these. 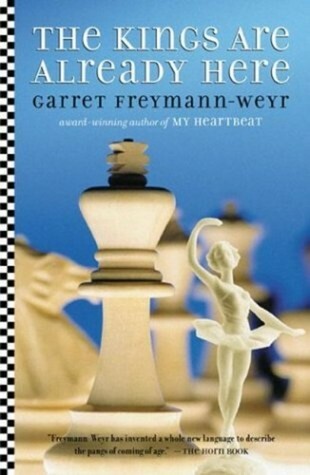 Very quiet book about two rather European pursuits: ballet and chess. Explores the author's usual themes of far-flung families and pursuing your individual talents. Good but not great. Very formal piece about two serious (and seriously scheduled & determined) youngsters, a ballet dancer & a chess player. Okay, not all that engaging. Too much in the head, I thought.